Banner placed near the Artemis Racing docks by a member of the Ballena Bay Yacht Club. 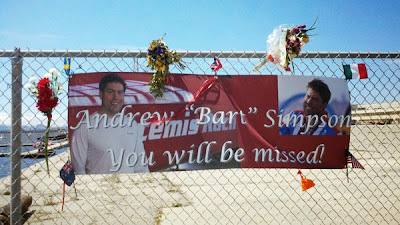 Simpson, 36, died during a May 9 practice run on San Francisco Bay. As I wrote in this space back in January: “In the sailing community, the death of a friend or family member is often recognized by an "Eight Bells" ceremony. The idea comes from the days of a sailor's watch being marked each hour by the ringing of a bell: Two bells at the end of the first hour, four at the second, six at the third, and then eight bells to mark the end of their watch. "Eight bells and all is well" is a time-honored announcement that has made it into the land vernacular as well. Luna Rossa Challenge mounts the wing and mast to their AC72. I happened to be out on Alameda Point Thursday afternoon to place two condolence cards signed by sailors at the Oakland and Island yacht clubs. Luna Rossa’s team was working with the crane; it appeared they had just completed mounting the wing to their boat, so it looks like they’re ready to place it in the water today or tomorrow. You can see the crane and boat in the photo, as well as the team flags flying at half-mast. Meanwhile, the team announced that team principal and Prada CEO Patrizio Bertelli is traveling to San Francisco "to follow closely and personally the development of the situation regarding the 34th America’s Cup." Additional details could be available Friday. Boat Fest takes place this weekend at Marina Village Yacht Harbor in Alameda. On a much happier note, come out to the Marina Village Yacht Harbor (just across Marina Village Parkway from the Lucky/CVS shopping center) today through Sunday for Northern California Boat Fest! This free event is held each year by the brokers at MVYH, and it’s a chance to wander the docks and dream of getting out on the water. (It doesn’t take much to get hooked; my wife and I bought our first boat at a yard sale.) Walk over to Gate 9 and look down the ramp, and you might even see the boat we live on. There’s music, food, wine tasting, and free seminars about various aspects of boating and sailing! It’s a great day out. Info is at http://www.boat-fest.com.